Here you'll find the Metal Dust story, hardware requirements, technical information and the Making Of. Of course the credits must be mentioned, too! Although at the moment there is no human ship that could stop Commander LaserRay, there are many handicaps until he can reach the crucial jump position and the New World. C64 or C128 in C64 mode, 1581 or CMD FD, CMD SuperCPU with SuperRAM card (at least 4 MB), 1 or 2 Joysticks. Also compatible with: CMD HD, CMD RAMLink, IEC-ATA. This game is PAL and partially NTSC compatible. On NTSC machines, the very last end boss and the end sequence run into timing problems. The rest of the game is fully playable. Mankind is (once again) near its end. The home world and its many colonies have been devastated. Are there that many enemy alien races? No. As usual, it has been mankind itself. The humans did not learn out of their mistakes. Billions have been killed during many civil wars. What have been the reasons? Technology? Resources? Mutants? We don't know. However, we can be sure that, in the end, the crucial interests have been influence or money. Probably both. Only rumors, legends and myths speak of a New World - hope for many. It is said to exist in another dimension, another galaxy, another universe. Long time ago, there was a secret clan who knew more than that found in legends. But the Sages only told the questioners, that mankind was not yet prepared for the New World. The Sages and their successors have been long dead, and there is only one person left who knows the way to the New World: Ray Harrison, after a successful fight against a superiority of aliens called "Commander LaserRay". The Full Megablaster Mk.II prototype has been finished. The simulations have been a complete success - the ship is supposed to do her first test flight. Commander LaserRay realizes that this is his only chance. He volunteers to do the test flight, and although some of the project leaders are surprised that the commander himself wants to test the ship, he gets the job. Commander LaserRay has taken his seat in the cockpit of the Full Megablaster Mk.II. The start has been successful, the flight and weapon controls are working with highest efficiency. Flight Control tells Commander LaserRay that the ship exceeds all expectations of her constructors. This is the signal for the commander: he ignores Flight Control when it wants him to return to the base. Despite of the imploring radio transmissions from Flight Control, he reaches light speed and sets the course to the coordinates for the jump through time and space. More than 1000 blocks of digi music data per level, exclusively composed by the band "Welle:Erdball"
In 1995, Big User aka Stefan Gutsch got the idea to program a Shoot'em Up for the Commodore 64 with the 8 MHz accelerator card "Flash8". He started as the only coder and graphician, and because he is not a musician, he digitized selected MOD music from the Amiga, using the DAISY digitizer. But because of the instability of the Flash8 card, Big User stopped development soon after. At this time, about 1997, Stefan Gutsch met Chester Kollschen, creator of the top games Ice Guys and Bomb Mania. Both coders had always dreamed of creating a Turrican-like game. The idea of an (inofficial) successor of Turrican I and II was born. To get every C64 user the chance to play the game, it was decided not to require the SuperCPU for this one. Now Stefan could concentrate on what he can do best, great graphics and creative level design. Chester started with the hard work of programming the game, workname "Turrican 3". The goal was to be not only as good as but even better than the predecessors. Finally music had been implemented, the end monsters got bigger and absolutely flicker free - using a completely new designed multiplex routine. The game could even load data while one could move the player. In 1998, the project was presented to a small bunch of people during a scene party. But during the night, the disk was stolen and the half completed game was spread around the internet. Shocked by the fact that such things could happen even in the fantastic C64 scene, Chester cancelled the work. Simultaneously, Factor 5, makers of the "Turrican" games on Amiga, threatened because of copyright issues. Half a year later, Chester started again to code, this time not a game, but a new operating system that one time shall replace GEOS. He thought that the SuperCPU offers a great deal of power and so much possibilities that there is a need for a new, SuperCPU-only operating system. CLiPS was born. Malte Mundt aka ThunderBlade could not accept the thought that such a fascinating game project should never be finished. He organised a new meeting between Stefan and Chester, where a new cooperation had been decided. Again Chester took over the code work and Stefan could concentrate on the graphics. In the meantime, Chester has recoded the complete game engine. The game concept has been redesigned and extended, for example by implementing the two-player mode. 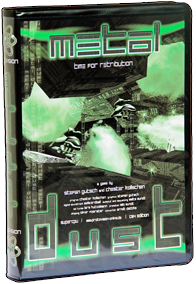 Malte and Chester reached an agreement with the band Welle:Erdball to get an exclusive sound track for Metal Dust. The graphics have been improved again, the levels got much better and much bigger. Malte digitized and arranged the music created by Welle:Erdball. The old enthusiasm is back. After a long time of hard work, Protovision can now present you Metal Dust, the first Shoot'em Up for the Commodore with SuperCPU.